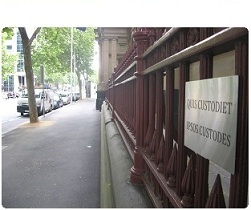 The Judicial College of Victoria have updated their Sentencing Manual. There's some really useful information there now in Part E. Tables lay out a history of cases considering a specified offence, the surrounding circumstances that were taken into account, and the penalties that were given. Compiling this sort of material has always been a royal pain and it makes good sense to gather it all in one place where all parties and courts will have access to it. To take an example, the offence of recklessly causing injury under s 18 of the Crimes Act 1958 can be dealt with in the County Court, but is more often dealt with summarily. Looking under this offence in the Sentencing Manual reveals a table of seven cases considered by the Court of Appeal (the most recent being R v Alexopoulos  VSCA, decided only two weeks ago). It includes the circumstances of the offence, the characteristics of the accused, a very brief outline of the Court's considerations, the result and a link to the case. It seems fair to assume that the JCV have chosen fairly representative cases to include in the collection, but it still pays to read the judgment thoroughly to avoid missing any unexpected factors which influenced the outcome. These tables are a work in progress. A few more examples under each category would be helpful. No doubt these will evolve over time. At the moment a lot of categories simply refer you to the Sentencing Advisory Council's homepage where you can view a variety of documents that they have compiled. I find these crunched numbers almost useless, especially the Sentencing Snapshots. The Sentencing Snapshot concerning recklessly causing injury reveals 6,493 people were sentenced for this offence in the Magistrates' Court over a four year period. 522 were placed on the diversion program. 705 received an immediate custodial term. There's a lot more data like this, all general information with no specifics. This kind of information is probably useful to policy makers and social scientists. It isn't of much assistance to a court when attempting to arrive at an appropriate sentence. While s 5(2)(b) of the Sentencing Act 1991 provides that a court must have regard to current sentencing trends, raw statistics don't give the full picture - or any real picture at all. How serious was the injury in the cases where imprisonment was the result? What were the mitigating factors in the cases which were diverted? Without these sorts of specifics the numbers themselves are meaningless. The Judicial Commission of New South Wales offers a subscription product called the Judicial Information Research System (JIRS). The system resembles the SAC's Sentencing Snapshots in compiling the results of government data to provide various tables, graphs, etc. the system allows more flexible searches to be conducted. Appellate NSW courts have expressed reservations about the utility of statistical data from JIRS when assessing whether a particular sentence was appropriate. 2 [The sentencing judge] imposed a sentence of imprisonment comprising a non-parole period of 2 years and 1 month dating from 7 December 2007 with a balance of term of 2 years and 2 months. 3 The challenge to the sentence is that it is manifestly excessive in light of his Honour’s finding that the offence was below the mid-range of objective seriousness. Support for that submission is said to derive from the Judicial Information Research System (JIRS) statistics which reveal that in only nine per cent of sentences for offending against s 112(1) which attracted full-time custody was a non-parole period imposed greater than 2 years and 1 month and only three per cent of sentences attracted a total term of imprisonment greater than or equal to 4 years and 3 months. 5 The Crown submitted, correctly in my view, that the inherent limitation on the utility of the statistics is most pronounced in relation to offences which involve a potentially diverse range of criminal conduct as is the case with an offence [of aggravated burglary]. In addition, it is self-evident that the greater number of factors specific to an offender, the smaller the statistical base from which might be identified a range of penalties. That is exemplified in the applicant’s case. There were only four offenders within the applicant’s age range who were also sentenced for a single count following a plea of guilty accompanied by a record of previous conviction of the same type. I'm not aware of any plans to develop a system like JIRS in Victoria. But as the database of specific cases builds in the Sentencing Manual it will become easier to avoid comparing apples with oranges.